There is nothing fun about having a epigastric pain or burning sensation in your stomach after you eat. In fact, the pain and discomfort that comes from stomach burning can be debilitating. Known by the medical term dyspepsia, that burning feeling you can get in your stomach after eating is a very common occurrence. Burning pain, heartburn, bloating, burping, nausea, and lack of appetite will affect one in four people at least once in their lifetime. Whether the burning pains in your stomach occurs regularly, occasionally, or only after you eat, there are a number of excellent natural remedies you can take to relieve the pain. What Causes Burning Sensations in Your Stomach? Painful burning sensations in your stomach can be caused by more than just a bad reaction to food. While diet is a major factor, that hot feeling in your stomach can also be a sign of digestive problems like gastritis, food allergies, or gastroesophageal reflux disease (GERD). Stomach burning can also be caused by infections, the overuse of antibiotics, chlorinated water, and even emotional stress. To understand what causes that burning sensation in your stomach, you need to understand how the stomach works. The stomach looks like the letter J and is located in the abdominal cavity below the esophagus and above the intestines. The two primary functions of the stomach are to receive and to store food. To help the body digest the food, your stomach secretes enzymes and acids that break down the food. 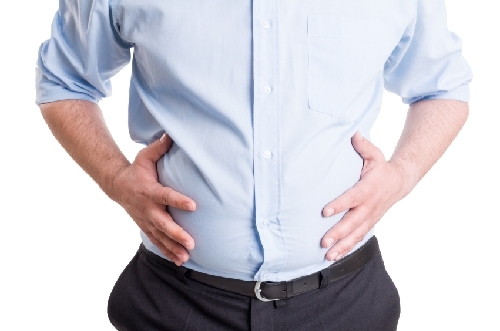 Food in your stomach (abdomen) that isn’t properly digested can result in indigestion and heartburn. Your stomach can act like a referee when you eat. If you eat too much or too quickly it can cause a stomach ache. This is your tummy’s way of telling you there is enough food in your body and to stop eating. Some people have trouble digesting certain types of food, including starches, gluten (grains), and spicy foods. At the same time, that burning in your stomach can also be a sign that you are getting dehydrated and your body is trying to break down all of the food. You may have a food allergy if you feel a hot, burning sensation in your stomach shortly after eating (even if you only eat a small amount of food). You might have intolerance to certain foods if the burning in your stomach comes on gradually, if it only happens when you eat a lot of food or if you eat certain types of food. Unlike a food allergy, intolerance to food is not life-threatening. In addition to spicy foods, the burning sensation in your stomach can come from the body’s inability to digest milk and dairy products. If you are lactose intolerant and eat dairy products, you will feel a burning sensation because the lactose blocks your ability to digest food. Stomach ulcers are painful, open sores found in the inner lining of the stomach. Stomach acid is necessary to help break down foods, but when it comes into contact with open sores, it causes a very painful, burning sensation. Many people feel the pain of stomach ulcers in the evening because that is when their stomachs are empty. GERD is chronic indigestion that occurs when stomach acid backs up into the esophagus and makes its way into the mouth. This usually happens because the stomach is not properly breaking down food. The reflux of stomach acids irritates the lining of the esophagus and causes GERD. Helicobacter pylori (H. pylori) bacterium interferes with digestion and causes a form of gastritis similar to heartburn; it could also be responsible for the burning sensation in your stomach. H. pylori bacterium is a relatively common bacterial infection that breaks down the protective lining of your stomach. Other health conditions that can result in gastritis include: smoking, heavy drinking, food allergies, celiac disease, and Crohn’s disease. There is a connection between the mind and the body. And stress can bring on different types of digestive problems. In addition to your digestive system being unable to function properly, emotional stress has been shown to slow down the digestion of food. As a result, stomach acid can remain in the stomach, causing stomach burning. Taking anti-inflammatory and non-steroidal drugs for pain or headaches can increase one’s risk of developing gastritis, which causes the burning feeling in the stomach. “Aspirin” and “Ibuprofen” are two popular non-steroidal drugs that can lead to stomach pain. If you are not regular, or if you haven’t had a bowel movement in several days, you could feel a burning sensation in your stomach. That’s because the stool can harden in your intestines, which puts painful pressure on your digestive tract. This gets even more painful after eating because the digestive tract begins to fill up. According to the National Center for Health Statistics, nearly five million Americans suffer from hernias. A hernia occurs when an organ or tissue pushes through a weak spot in your muscles. Injuries, constipation, sneezing, heavy lifting, obesity, and diarrhea can cause a stomach or hiatal hernia, which can be mistaken for a burning sensation in the stomach. Appendicitis is an inflammation of the appendix that can be mistaken for stomach burning. Appendicitis causes a shooting pain down the lower right side of the stomach, especially after eating. One of the best ways to deal with that burning sensation in your stomach is to maintain a healthy diet. Foods rich in fiber, like fruits and vegetables or cereals can help speed up digestion and relieve constipation. Ginger reduces intestinal inflammation; peppermint is used to treat cramps and honey can ease intestinal lesions. Buttermilk and yogurt can help ease the burning sensation in your stomach while chamomile can ease tensed muscles in your intestines. Probiotics are healthy bacteria that keep the stomach healthy. Probiotic-rich foods that help with digestion include yogurt, honey, kefir (similar to yogurt), sauerkraut, dark chocolate, miso soup, kimchi, and kombucha tea. It’s important to have a healthy diet, but that doesn’t just mean eating the right foods. It also means avoiding certain foods, like processed, fatty foods, baked goods, candy, soda pop (fizzy drinks), coffee, and junk food. Avoid foods that upset your stomach, like spicy foods and starches like potatoes. What you eat is important. So too is how much you eat. To prevent stomach burning, limit your portions. Or, eat smaller meals more often. Exercise can help relieve stress. Approximately 30 minutes to 60 minutes of exercise each day can help prevent a burning sensation in your stomach. Make an effort to take a daily walk or a light jog. Other lifestyle choices can also help eliminate indigestion; that includes limiting how much alcohol you consume and quitting smoking. A burning sensation in your stomach after you eat can also be a sign of a much greater problem. Appendicitis and hernias are often mistaken for digestive problems. But they are severe problems that can be cured with surgery. You should consult your health practitioner if the burning in your stomach lasts for more than a few days or if you are in a lot of pain. If the pain in your stomach persists or gets worse, call 911 or go to an emergency room. There are numerous reasons why you may suffer from a burning feeling in your stomach. The question is, how do you treat that burning feeling? It all depends on the cause. Most stomach issues, while painful, are non-life-threatening. Treatments can include dieting, exercise, natural remedies, medication, and other lifestyle changes. On the other hand, a burning sensation in the stomach can be symptomatic of something much more serious. It’s important that we understand what our bodies are telling us and to recognize whether the symptoms are severe enough to call a doctor. “Q&A,” Hernia Resource Center web site, November 26, 2015; http://www.herniainfo.com/q-a/. “Indigestion,” U.S. National Library of Medicine, November 26, 2015; https://www.nlm.nih.gov/medlineplus/ency/article/003260.htm. “Good Foods to Help Your Digestion,” National Health Services web site, November 26, 2015; http://www.nhs.uk/Livewell/digestive-health/Pages/stomach-friendly-foods.aspx.